I hope to participate in the annual ArtWalk festivities in Red Bluff, CA. Businesses have open houses, and a limited number of them host an artist. I am hoping to participate as a business and an artist. They close of part of downtown, have food and drink and live bands. Last year over 3000 people attended. Not bad for a town of 13K. There is a little bit of red tape and maybe some crony-ism going on, so I do not know yet if I will be able to do as I hope. I am forging ahead with the glass work as though the verdict is the one i want. I plan to have the Breaching Humpback, Jellyfish, Sunflower, 2 Fish Windsocks, a Northern Lights and a detail of the Angel’s Trumpet and Hummingbird piece. Fingers crossed. All done and ready by November 4th. I think I might actually make it work. It would be great if I could get more done, but that is the plan I am working with. The second humpback piece has been morphing in my mind, into something different, something more personal, and I am not yet ready to work on it, so that is tabled, for now. Did I post the Jellies? 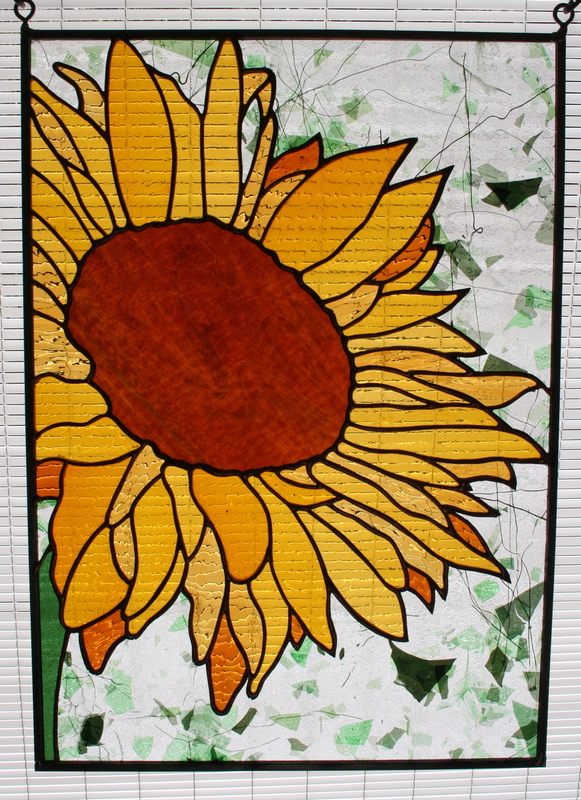 The latest finished piece is the Sunflower. Love this. Taken from an issue of Stained Glass News, with some petal modifications. I just can’t seem to resist messing with each pattern. there is always something that i can tweek, lol. Finished size is 14.75 x 20.75. Price is $175. Like i said, I am super happy with this piece and will enjoy it until November. 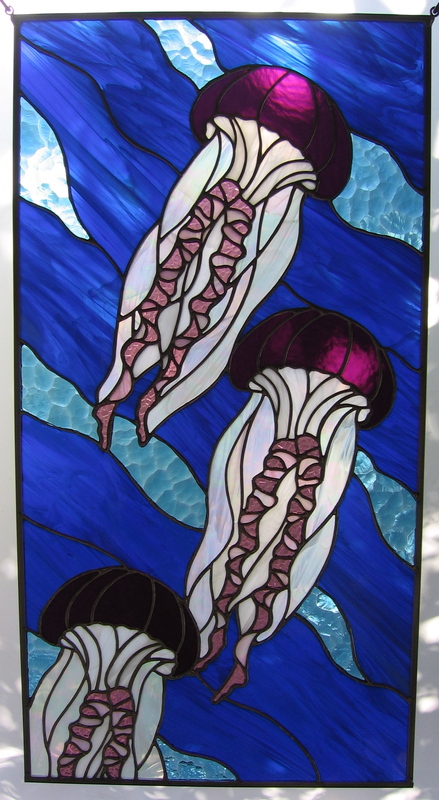 I stumbled onto another glass artists website, or her link on another glass website, ArtFire.com, while i was looking for a pattern. I really like her work. the Queen of Hearts piece is gorgeous. Her prices are substantial and I am curious if she actually sells stuff for those prices. It would probably be rude to ask, though. If she can, then more power to her!! I like her fuschia hair too. ok. gotta hit the shower and head to work. Have a great day! ~ by kellig on August 22, 2011.